That calls for the camera. the owner had planted 4 apple trees. But 3 trees are enough for making apple sauce. Awesome. My hubby wants apple trees! Enjoy your applesauce! mother always made apple crisp with ugly apples and pear crisp with ugly pears... we have a picker like this, the yellow one not the man, ecept ours is for avocados and grapefruit. There are a few sticky traps to use and still be pesticide free.You use a red orb that resembles a ripe apple and it attracts the codling moths. They look rustic, not ugly. I bet the make great sauce! Certainly is, I love homemade applesauce! no baking with those apples? I love homemade applesauce but not the corse kind. My Mom used to make the corse and I disliked it. I have to have mine smooth like a baby has in baby food. Ha-ha. It's not at all ugly when it's made into applesauce. 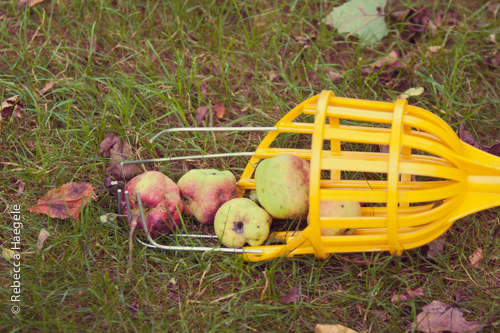 Is that yellow thing specifically for picking apples or a Haegele invention? I wish I liked applesauce, bad experience when I was a kid growing up at home with my parents applesauce. I am sure yours will be fabulous. Homemade apple sauce sounds wonderful. 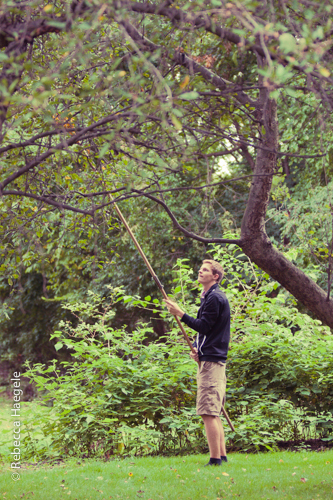 We have a couple of apple trees too, also organic. 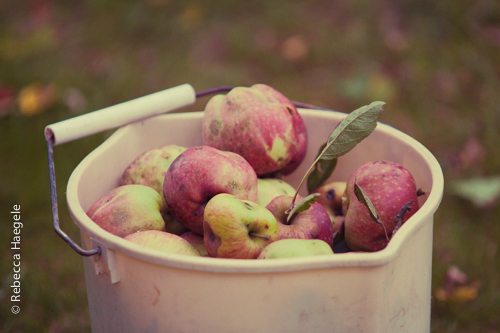 A friend takes our apples to make delicious cider. That's more than we got.. We didn't get hit by Sandy, we actually didn't know what hit our fuji apple tree but over night ALL the fruit which were the size of golf balls were gone... Thanks for partying with us :). 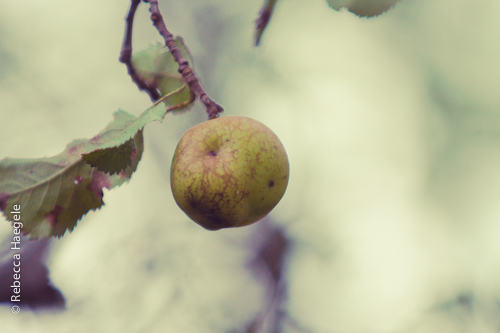 I don't think it matters that they are irregularly shaped, they are your own grown apples and that is special.